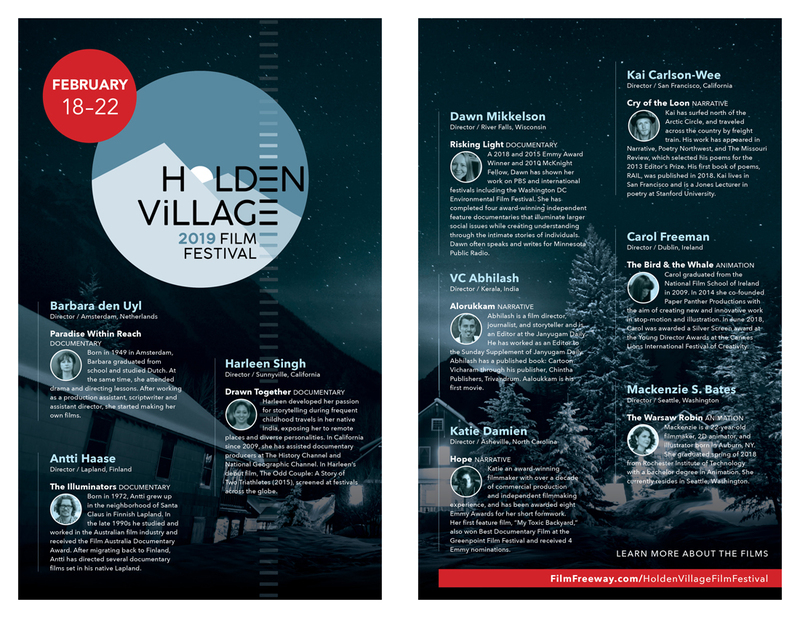 Interested in visiting Holden during the film festival? See Rates & Registration. Hard Copy Preview DVD sent to Holden Village: DVDs must be submitted in plastic safe cases and should be formatted as an MPEG file. DVDs should not include labels or stickers of any kind. We recommend testing your DVD on several makes and models of DVD players. DVDs will not be returned unless a self-addressed prepaid return envelope is provided. accept digital copies of films. The makers of award winning films will be asked to participate in one or two panel discussions throughout festival week, a Q&A session following the showing of their film, as well as attending the films of others. Because Holden is a spiritual community, attendance at daily worship is also expected. Description: An LGBT+ silence romance film that follows the story of Hannah, a hopeless romantic writer, who goes to a local library every day to write. After an unexpected introduction to Athena, a hipster musician, the two teenage girls flirt for days and unexpectedly fall for one another. One day, Hannah gets the guts to ask Athena out on a date. She runs after her and finds out Athena may not be the innocent girl she said she was. Led by the whisper of the river, Seattle fishing guide and storyteller Timothy Thomas Burke has inspired anglers throughout the Pacific Northwest. With creativity, drive, and endless ideas, Timothy has written about his adventures, helped produce films and is an entrepreneur at heart. Patagonia, Meiser Spey Rods, and Simms Fishing Gear support his love for the outdoors. From the rugged Cascades to the snow-capped Olympics, Timothy loves to hunt for mule deer and elk. In his home town of Kirkland he spends his time investing in his local church, serving the underprivileged, tying flies, and building fly rods. Timothy works as a business developer for Longevity Development and Relief Factor supplement company in sales, strategy, and marketing. He received his BS in Pastoral ministry from Corban University and Masters of Divinity from Western Seminary in Portland, Oregon. Timothy’s motivation comes from his faith and from his grandfather who believed he could do anything. Timothy and his family — David, Seth, Justin, and Christina — live in Washington and Oregon. Description: For the Burke brothers of Yakima, Washington, the river is a life source. As young boys from a home torn apart by alcoholism and broken promises, they found refuge and redemption in their backyard creek - losing themselves in the rush of cold water beneath their feet, playing, laughing, and chasing minnows into a 5-gallon bucket. Through the years their love of fishing together would grow and take them to the Yakima River, Columbia River tributaries and other storied steelhead waters of the Pacific Northwest where as men they reunite faithfully to this day. For them the river has been a constant friend and a place of mending: mending their spey lines through the currents of a steelhead run and mending what had once been torn in life into the unbreakable bonds of brotherhood. Brothers is a glimpse into their shared passion for wild steelhead as they swing flies on a harsh winter day on the Olympic Peninsula. Despite miserable conditions their unwavering hope on the water, as in life, proves essential in once again connecting with such a rare and powerful fish, and to each other. Trudy is a graduate of the University of Kansas, Union Theological Seminary in New York City, and a longtime interfaith hospital chaplain. She learned hands-on lessons about death, dying, and grief working with volunteers in the early days of the AIDS epidemic in Arkansas. Later she worked with an AIDS agency in Seattle and served as a chaplain at the Seattle Cancer Care Alliance. After retiring, she spent four years pioneering community-based end-of-life planning workshops and two years producing this film and working with Jennifer Jones to capture stories and images to overcome the taboos surrounding death. Speaking of Dying helps individuals, groups, and families become more comfortable discussing the choices and resources needed to plan for good endings. She has also trained ten Heartwork facilitators who conduct end-of-life workshops throughout the Puget Sound area and in other states. In past years Trudy has offered classes on pastoral care and listening and she has facilitated retreats for Holden staff members. Jennifer Jones is an independent documentary filmmaker. With her newly released short film, Speaking of Dying. (2015), she has developed a keen interest in stories surrounding conscious dying. Description: “Speaking of Dying” , a 30 minute documentary film, is meant to change that tide by shining a bright light on death and by showing us some of the choices and resources for a better ending, and most especially the value of speaking about our own ending with loved ones before there is a crisis. Marleia Alfaro grew up in San Diego, California with a dream of becoming an Animator. She achieved a Bachelors in Art Multimedia from San Diego State, and graduated with a Master of Fine Arts in 3D Character Animation from Academy of Art University, San Francisco. "Barry the Blobfish" is her first original film and Master's Thesis. Marleia recently completed an internship with the Disney College Program in Anaheim, and currently works at the Disneyland Resort. Description: "Barry the Blobfish" is the story about a fat ugly deep sea fish who longs to live in the sun! Barry learns that sometimes, it's impossible to reach your goals alone. Bio: Passionate and professional, Matt’s varied interests and experience allow him to fi­nd a personal connection to any story. When a life changing event as a reserve Police Officer reminded him to follow his bliss, Matt wound down his ­first “career”, developing software for international banks and hedge funds, and re-focused on his life-long passion–storytelling. After several successful short ­films, Matt attended the AFI Conservatory, graduating with an MFA in Directing. He took the long road to ­film making, but says it prepared him to tell stories in ways that he couldn’t have imagined, or planned without the leadership and life experience he gathered along the way. Description: The true story of Bosco, a young musician, orphaned in the Burundian genocide. Taken in by a member of the group responsible for the death of his mother, Bosco must choose between hatred and hope. Coming from a background in performing arts and dance, Maxime is a proud French Canadian from eastern Ottawa, where he quickly found out that imagination was one of our most precious tools. Visual story telling is the passion that compels him to direct short films and music videos in partnership with diverse artists that now screens in festivals around the world. The Prada Brothers are two producers, directors, and writers that have more than 10 years of experience making short and full length films. Between them, they have obtained more than 100 awards and more than 800 selections at international film festivals. “Arriving” is their latest short film and they are currently in the post-production process for the “Dorien,” a fictional series produced by RTVE. Description:“Arriving” is a short film that speaks of personal overcoming of adversity and how this is reflected in today's society. Many young people today struggle to achieve their goals or are unable to achieve them. The system and the way in which they make us believe as we should live is part of this struggle. The character of our short has probably been carried away by "the tide" of life. She has led a day to day messy, addictive existence, and that has led her to lose track. Now she wants to take back the "helm" and fight against "the tide" of life.